Ever experience an urge to create something amazing? Your second chakra is about experiencing joy and passion in life. It’s the seat of your creativity. This is a yin chakra. It’s connected to the feminine essence which is about being open to change and bringing forth new life. About the symbol for this chakra: Mystics saw it as a flower having six petals. Each petal corresponds to a different Sanskrit syllable. The crescent moon is a symbol of this chakra’s close connection to the feminine aspect. 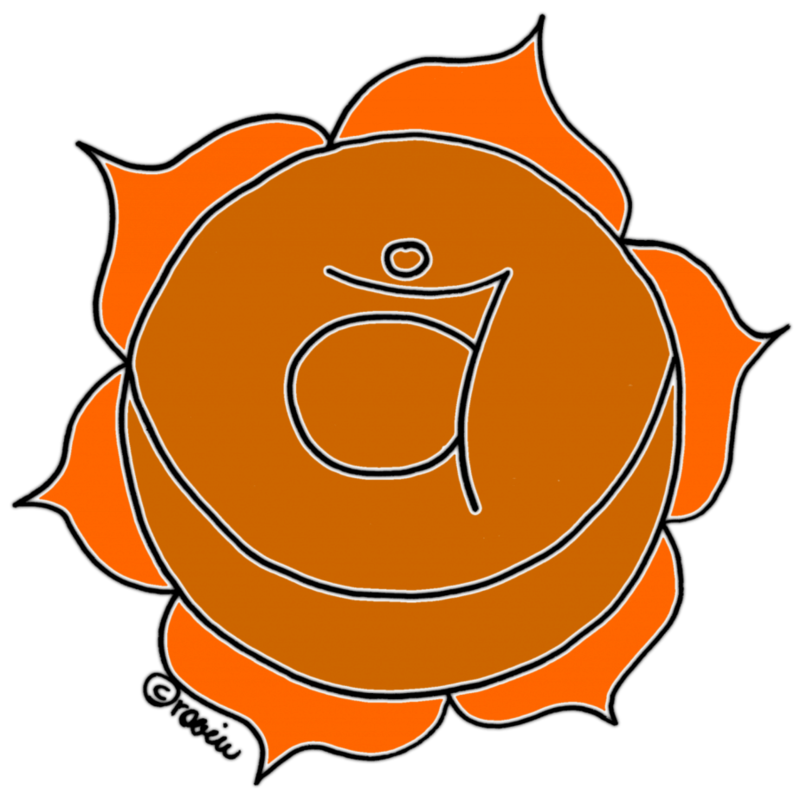 The symbol at the center represents the Sanskrit word for this chakra: Svadhisthana. What energy is it associated with? Its healthy function speaks to the quality of creative energy, sensuality, sexuality, and fun you experience. What happens to you when you have a creative idea or longing? Do you make the time and space for it to happen? Are you able to stay with it and allow the ideas to build? Or, are you more like a butterfly flitting from flower to flower? Do you sometimes feel you lack the passion or drive to make it happen? Are you comfortable allowing pleasure to be alive in your body? Do you know you are in charge of creating your own pleasure? Are you taking time to enjoy the little things? Or, are you uncomfortable with the idea of rest and relaxation? Does free time make you feel anxious? Do you embrace change easily? Are you someone who can go with the flow? Does change bring up anxiety? Is there a fear of the unknown? How do you feel about your body? Do you like what you see in the mirror? Are there times when you feel that the way you look is unacceptable? When your swadhisthana chakra is out of balance or closed, you may feel that it’s challenging to experience joy, excitement, change, fun, passion, and to embrace creative flow. In those moments, it may seem like something is wrong even if there is no reason for it. You may search and search your mind looking for the reason why, but wind up finding nothing. Feelings of guilt or shame are often present with this. It’s like you’re just not good enough. You may find that it is difficult to experience the sweetness of life at times. Like there is little fun you’re having, and you are too driven. Other times, it feels like you are overindulging in the fun, and you have a sense of feeling overburdened by all that there is to do. These are a few of the signs that are inviting you to put some attention and energy into working with the issues coming up so you can heal this chakra. What can you do to support your second chakra? First of all, it is your birthright to experience joy and peace on an everyday basis! Allow play to be as important as work. Start noticing the way you undervalue You Time in favor of taking care of everyone else. Welcome your pleasure. What kinds of fun do you like to have? What brings joy for you? Try to incorporate some of these activities on a weekly basis. Especially the ones you think you’re too old to do now. Yoga Poses that support this center: Pigeon, cobra, upward dog, goddess squat. Breathing. I’ve mentioned before that you do not have to practice fancy breathwork…just breathe in and out and let go of what is stressful in the moment. Foods that are 2nd chakra pleasing: Juicy sweet fruits and leafy greens are great. Be sure to get plenty of fresh water and consider fresh veggie juices (I’m not talking about v8 though). Notice your cravings. Cravings are a sign that you’re longing for something much deeper than food. Please, do not shame yourself anymore about what you are eating and drinking. Instead, let’s kick it up a notch and start noticing WHY you are doing it. Making the connection is so much more helpful than shaming the behavior. What healing exercises can you do to help stabilize the second chakra? Stand up. Take a moment to let yourself connect to the earth. Breathe. Say something kind to yourself like, all is well. Try moving your hips in a slow circle. Imagine there is a bowl of nectar sitting inside your pelvis and you are gently swirling it in circles with your hips. Might seem goofy at first, but this is very effective. What essential oils help this chakra? Essential oils are the life force of a plant. Oils that work well for this chakra are frankincense, sweet orange, jasmine, cypress, and patchouli. Try putting some just above your pubic bone, or on your back near the sacrum. Baths with drops of oils are great too! I’ve written a post on the first chakra as well as an overview of the seven major chakras, you might like to check them out for more helpful tips. If you had a few ah-ha! moments reading this and you’d like some help exploring further, get in touch with me here. I’m here for you.